Question: How can the Great Pyramid be said to be "an altar to the LORD in the midst of the land of Egypt," and also "a pillar at the border thereof to the LORD" (Isa. 19:19)? Answer: The reference here is not to a literal altar, but to a symbolic altar; hence only symbolic sacrifices, not literal sacrifices, belong to it. The Christ is the literal altar of God, typed by the tabernacle's altars and symbolized by the Pyramid. The Pyramid is on an elevated rocky plain, overlook­ing the Nile River, not far from Cairo, Egypt. 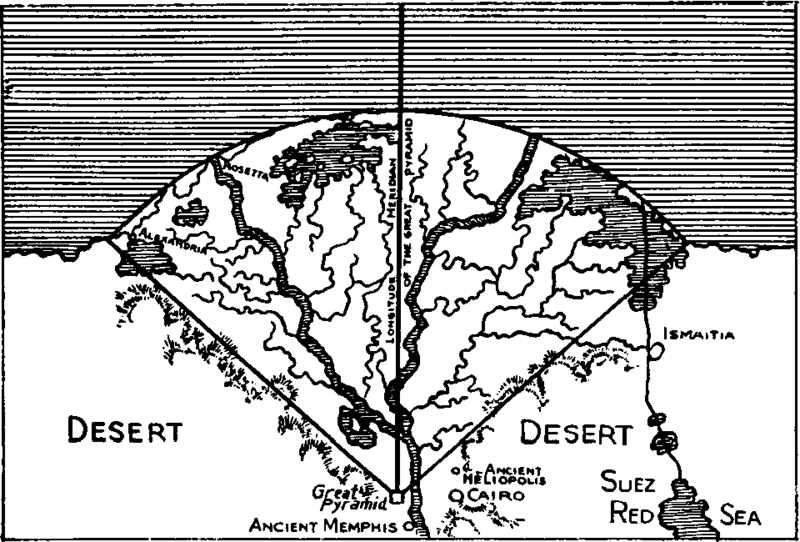 A remarkable thing in connection with its situation is that the Nile delta forms a seacoast which in shape is a true quarter-circle, with the Pyramid marking the inner angle. This relationship of the Pyramid to the coast was discovered by Mr. Henry Mitchell, Chief Hydrographer of the U.S. Coast Survey, who visited Egypt in 1868 to report the progress of the Suez Canal. His observation of the regularity of the curvature along the whole of Egypt's northern coast led him to conclude that some central point of physical origination was indicated. On searching for this grand center, he found it marked by the Great Pyramid, which led him to exclaim: "That monument stands in a more important physical situation than any other building erected by man." A line drawn from the entrance passage due north would pass through the northernmost point of Egypt's coast; and lines drawn in continuation of the northeast and northwest diagonals of the structure would enclose the delta's either side, so embracing the fan-shaped country of Lower Egypt (see illustration). Built upon the northernmost edge of the Gizeh cliff, and looking out over this sector, or open-fan-shaped land of Lower Egypt, it may be truly said to be at the very border and in its nominal center, as described in Isa. 19:19. We should keep in mind that two Egypts are men­tioned in the Bible—Lower and Upper Egypt. When only one is meant, the Hebrew word Mazor is used (Isa. 19:6; 37:25; 2 Kings 19:24; Mic. 7:12; see Gesen­ius); but when both are meant, as in Isa. 19:19, the Hebrew word Mizraim, two Egypts, is used (Gen. 50:11, etc.). The Great Pyramid is on the boundary between these two Egypts and thus is on the border of these two Egypts and is also "in their midst," i.e., between them. 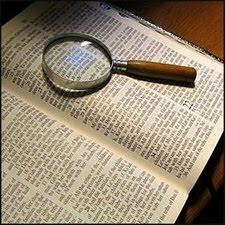 The Hebrew word betoch is frequently in the Bible translated by the words between, in and within. Thus it is in, within, both of these Egypts and on the border which separates them. Question: When was the Great Pyramid built? Answer: Prof. C. Piazzi Smyth originally concluded that the Pyramid was built in 2170 B.C. He based his conclusion primarily on astronomical calculations. By computing the position of the stars in relation to the Pyramid, he calculated that in 2170 B.C., Alpha Dra­conis, the chief star of the Dragon constellation, a symbol of sin and Satan, shone down the central axis of the Descending Passage at midnight of the autumnal equinox. He calculated that at precisely this same in­stant Alcyone, a notable star of the Pleiades group, a symbol of God and the center of the universe, stood exactly on the meridian of the Pyramid, at that point in the heavens which is at right angles to the downward inclination of the Descending Passage. Prof. Smyth claimed that if 2170 B.C. was not ab­solutely correct, then the correct date would be "at least closer thereto than the beginning or end of the duration of the Pyramid's building can be to its middle date." The relative positions of Alpha Draconis and Alcyone with reference to the Pyramid's meridian and Descend­ing Passage, were very carefully recalculated by the eminent astronomer, Richard A. Proctor, and 2140 B.C. was pronounced by him as more likely to be correct. To this Prof. Smyth agreed, saying in later editions of Our Inheritance in the Great Pyramid that 2140 B.C. might be considered as fairly well established. Thus the autumn of 2140 B.C. probably saw the completion of the building operations on the Pyramid, whereas 2170 B.C., 30 years earlier, probably saw the commencement of these operations; for Herodotus informs us that the Pyramid took 30 years to complete. This date, 2140 B.C., is also marked internally in the Pyramid by means of a time measurement in Pyramid inches. On each sidewall of the Descending Passage there is a perfectly straight, deeply scored line, evidently drawn with a metal tool by the ancient workmen. These scored lines, opposite each other, are exactly at right angles to the incline of the passage. Measuring down the First Ascending Passage from the north wall of the Grand Gallery to the point of intersection with the Descending Passage yields 1543.5 Pyramid inches. Measuring up the Descending Passage from this point of intersection to the scored lines is 628 Pyramid inches. This total distance is 2171.5 Pyramid inches. Recog­nizing that the north end of the Grand Gallery repre­sents our Lord's death in the spring of 33 A.D., then 2171½ years prior to this takes us to the autumn of 2140 B.C. Thus the Pyramid itself, by means of these scored lines, indicates the date of its own completion! Question: What are some of the scientific features of the Great Pyramid? Answer: The first work of importance on the sub­ject, proving the Great Pyramid has scientific features, was in 1859 by John Taylor of England. Since then the attention of many able men, including Prof. C. Piazzi Smyth, Robert Menzies, Col. Howard Vyse, Sir Flinders Petrie, Dr. Joseph A. Seiss, Dr. John A. and Morton Edgar, etc., has been given to the further study of the testimony of this wonderful structure and witness. Many such features have been discovered; a few of the simpler ones are presented here. Pyramid measurements are based on the Hebrew cubit, which is 25.027 British inches in length. One Pyramid cubit equals 25 Pyramid inches. Modern cal­culations have shown that the Pyramid inch is the ½ billionth part of the earth's polar diameter. The length of each side of the base of the Pyramid is 365.2422 cubits. Our astronomical or tropical year has a mean length of 365.2422454 mean solar days. Also the perimeter of the base of the Pyramid is 36524.22 Pyramid inches, the length of 100 years expressed in days. Determinations of such accuracy were not pos­sible to man before the 20th century. The angle of slope of the sides of the Pyramid is such that they meet at an apex with a height of 232.52 cubits. The perimeter of the base divided by twice this height produces 3.14159+ or pi, i.e., the ratio of the circumference to the diameter of a circle. This rela­tionship was supposedly first discovered by the Greeks, 2500 years after the Pyramid was built. The mean distance from the earth to the sun is variously estimated as between 91 and 93 million miles. The vertical distance between the Pyramid's apex and the socket base level is 5813.0101 Pyramid inches. This distance converted to British miles is .091837578 miles. The Pyramid's height is the one-billionth part of the distance to the sun. The precession of the equinoxes is caused by the gyration of the earth's axis—the slow, orderly, progres­sive change in the position of its axis of rotation. Due to the tilting of this axis the sun appears to cross the earth's equator twice during the earth's revolution around the sun. These two times are called the vernal and autumnal equinoxes, i.e., equal periods of day and night. Since the earth's gyration is opposite to the earth's revolution around the sun, the equinoxes occur every year a little before each complete revolution is made and are therefore said to precede themselves. The period of years in which the complete cycle is accomplished is called the "precessional cycle of the equinoxes." The length of the precessional cycle is variously given because the rate of precession is not constant. In pop­ular reference works a period of 25,800 years is given, which approximates its length based on the current rate. However, the figure for the average length of a complete precessional cycle is a mean between its great­est and least possible lengths. These figures are based on computations covering 2,000,000 years, which show the limits of the fluctuation in the precessional rate. John N. Stockwell, M.A., in his Memoir of the Secu­lar Variations, published in Smithsonian Contributions to Knowledge, Vol. 18, states: "The mean value of the precession … in a Julian year, is equal to 50".438239; whence it follows, that the equinoxes perform a com­plete revolution in the heavens in the average interval of 25,694.8 years." This figure stated in Julian years of 365.25 days, is equal to 25,695.3 of the true tropical years. Sir Robert Stawell Ball, in his Elements of Astronomy, p. 365, shows that the duration of the precessional cycle is 25,694 to 25,695 years. The Great Pyramid of Gizeh in a number of ways records this cycle as being between 25,694 and 25,695 years. For example, Dr. John and Morton Edgar, well-known pyramidologists, after their many visits to and accurate measurements of the Great Pyramid, pointed out that the sum of the lengths of the two diagonals of the Pyramid's base at the platform level (each being 12,847.1764 Pyramid inches) is 25,694.3528 Pyramid inches, thus indicating that many years; also the same number of inches is found again as the perimeter of the Pyramid at the level of the floor terminal of the Grand Gallery. The position of the Pyramid marks the center of the land surface of the whole earth. There is more land surface in both its meridian (31st degree) and its lati­tude (30th degree) than in any other meridian or latitude of the globe. Its orientation to true astronom­ical north deviates only 5 minutes of arc to the west. Such positioning many thousands of years ago required a knowledge of the entire world that could not be humanly ascertainable at that time. Some of the other earth-commensurable proportions of the Pyramid which have been worked out include the spheroidal shape of the earth, the proportion of the land and ocean surface of the earth, the average density and cubical bulk of the earth, the obliquity of the ecliptic, the length of the synodic month, etc. Indeed, such knowledge evidenced at such an early age confirms the Divine authorship of the Great Pyra­mid (Job 38:4-7). Aside from these various earth-commensurable pro­portions, the Pyramid also demonstrates various mathe­matical proportions. The Pythagorean theorem is demonstrated in the King's Chamber. Named after Pythagoras, the Greek mathematician who supposedly discovered it, the theorem states that the sum of the squares of the two legs of a right-angled triangle equal the square of its hypotenuse. "Pythagorean numbers" are so related, for example, 32 + 42 = 52.